Mastoiditis is the inflammation of the mastoid sinus located behind the middle ear. It is a fairly common disease and is often ignored. It can be a serious condition if the spreads outside the mastoid bone, as especially to the meninges and brain, causing meningoencephalitis. It can affect both children and adults. It typically causes pain felt in or behind the ear, accompanied by the swelling of the area behind the ear, as well as ear discharge, fever, and headaches. The most common cause of mastoiditis is an untreated inner ear infection, also known as otitis media. Less frequently, it can be caused by a condition called cholesteatoma, which is an abnormal growing collection of skin cells inside the ear preventing the ear from draining. Sometimes, mastoiditis is clinically silent and may only be seen on imaging. In fact, a study performed on 468 CT scans revealed incidental mastoid sinus opacification (an imaging feature of mastoiditis) in up to 13% cases. There are several types of mastoiditis – Noncoalescent mastoiditis is characterized by the presence of fluid in the mastoid sinus, and may not be an infectious disease but it is associated with acute otitis media. Coalescent mastoiditis is destructive and is characterized by destruction of bony trabeculae or cortex of the temporal bone. Cancers such as rhabdomyosarcoma and Langerhans cell histiocytosis can mimic mastoiditis. 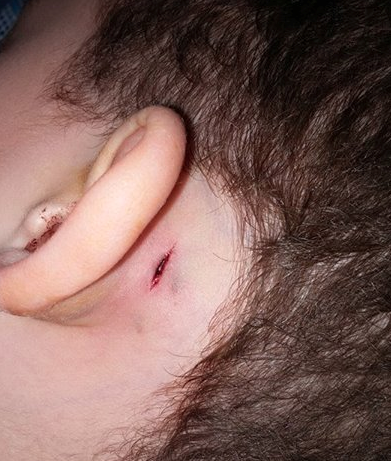 Diagnosis of mastoiditis begins is clinical and begins with a history and physical exam. It is confirmed on x-ray, CT, MRI, and in some cases tissue culture or a lumbar puncture (when meningitis is suspected). It is treated with systemic antibiotics and requires hospitalization. In some cases, surgery is required to debride infected and necrotic tissue. In milder cases, home remedies can help ease symptoms of mastoiditis, and include over-the-counter (OTC) painkillers and antipyretics, and placing warm compresses on the ear to reduce pain and swelling. The surest way to prevent mastoiditis is to prevent acute otitis media or by treating it early so that it doesn’t lead to mastoiditis. If untreated, it can lead to serious complications, including hearing loss, bone infection, brain abscess, and meningitis. Other complications include facial paralysis, which requires a myringotomy with PE tube placement. Lateral sinus thrombosis is another rare but serious complication (causing headache, vomiting, fever, diplopia, papilledema, sixth nerve palsy, seventh nerve palsy, and unilateral cerebellar ataxia). Labyrinthitis is also associated with mastoiditis (and could be in the form of purulent labyrinthitis or labyrinthitis ossificans). These patients are at high risk of developing a brain abscess or meningoencephalitis, and require brain imaging as well as a lumbar puncture, along with the placement of the PE tube and administration of IV antibiotics, with some even requiring mastoidectomy. Gradenigo’s syndrome (Petrous apicitis) is another rare complication of mastoiditis and presents with severe frontal headache, eye pain, diplopia, dizziness, nausea, and 6th nerve palsy, with MRI shows inflammation of the petrous apex and mastoids, and is best treated with myringotomy with PE tube, and IV antibiotic therapy.